Part Used & Method for Pharmaceutical Preparations: The rhizomes are dug from September to November. After the fibrous roots have been removed, the rhizomes are washed, cut into slices and pounded to extract the juice, or the skin is peeled off for usage. 1. Wind-cold exterior syndrome manifested as chills, fever, headache and nasal obstruction. The herb is used to strengthen the diaphoretic function. 2. Vomiting due to cold in the stomach. 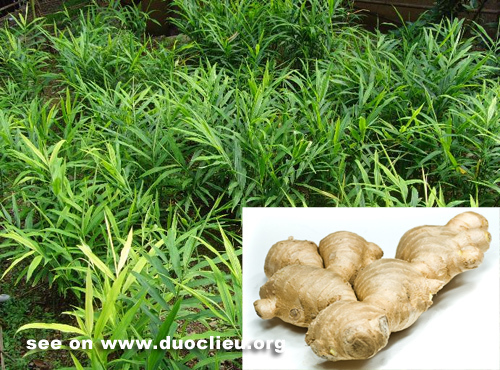 Fresh ginger (Shengjiang) is often used with Pinellia tuber (Banxia). In vomiting due to heat in the stomach, Fresh ginger (Shengjiang) should be used with Bamboo shavings (Zhuru) and Coptis root (Huanglian). Cautions & Contraindications: This herb is contraindicated in yin deficiency with excessive heat in the interior. Fresh ginger skin refers to the skin of the Zingiberis rhizome, which is pungent and cool in property. The herb harmonizes the spleen and promotes water-metabolism. It is mainly indicated in edema. Fresh ginger skin (Shengjiangpi) is often combined with Poria peel (Fulingpi) and Mulberry bark (Sangbaipi) to treat edema. The dosage is 3-10 g.